In the tiny English village of Hursley, two lifelong acquaintances have never given each other a second glance. Until, on the very night of man's first moon landing, a precipitous passion alights on their middle-aged existence. Out for a stroll, Norris Lamb--postmaster, stamp collector, and church organist--spies spinster Vida Stephen dancing with glorious, uncharacteristic abandon by the moonlit fountain of the mansion where she tends the mute, retarded son of an absent employer. Norris senses a buried bravado and romance, a fragility and loneliness, that match his own. And he sets out, covertly, to woo her. But both Norris and Vida are innocents in this endeavor. His courtship blunders down many wrong turns before it finds its unlooked-for catalyst in Manford, the gentle young man who is Vida's charge...and blossoms as a force to change three lives. 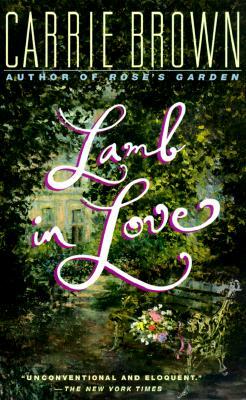 In luminous prose laced with quiet humor, Lamb in Love shows how love transforms the most ordinary and imperfect mortals. Vida, unaware that Norris is in the throes of a wild--but unvoiced--passion, must herself decide whether to remain in the small English village where she has lived her entire life, or strike out on her own in search of a grand adventure. "Brown eloquently explores the terrain of human interactions, showing how genuine love can exalt ordinary individuals." "Brown takes such care with these simple people's hopes and fears that before we know it, their luminary love seems as wondrous as anything else on earth, or beyond." "There are stories that please because of a writer's deft touch; others are propelled by a storyteller's skill. And then there are a very few that touch the heart in ways hard to describe, that speak to dreams and shared humanity. Lamb in Love is all of these things."